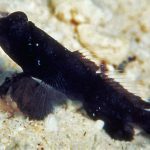 There are a multitude of new gobies out there in the tropical Indo-Pacific waiting to be discovered, and the lengths one must go through to find and name them can be daunting. 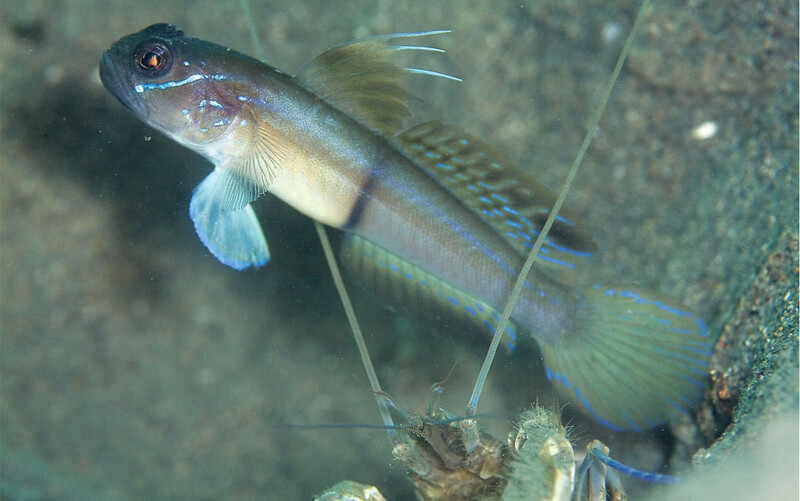 Take, for instance, the recently described Belted Shrimpgoby (Myersina balteata), which is known from just a single specimen, speared by the legendary ichthyologist John Randall… in 1973… at Guadalcanal… at a depth of 54 meters… from the wreckage of a Japanese transport vessel sunk during the island’s famous WWII battle. 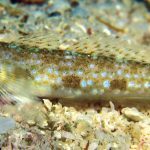 It’s remarkable to think that this unknown fish sat pickled in a jar for more than four decades, patiently waiting for the right researcher to get around to studying it, and even more remarkable when one considers that it might not have ever been discovered if not for the incomprehensible carnage of a world war. Still, there are many more undescribed species in this group waiting for their taxonomic moment in the sun. 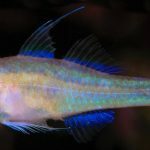 Myersina is the forgotten middle-child of shrimpgobies, full of beautiful fishes that exist at the periphery of our knowledge. Unlike their coral-associated cousins in Cryptocentrus and Amblyeleotris and Stonogobiops, the species classified in Myersina appear to favor heavily silted environments and are thus normally far-removed from where most divers and researchers venture. Though what precisely constitutes a Myersina goby is still a bit up in the air. The morphological traits used to define it are imperfect and blend into the closely related Cryptocentrus and Stonogobiops. In M. balteata, there are scales along the midline of the nape that ought not be there—it’s a trait common to Cryptocentrus—but the species is otherwise more comparable to something like M. yangii in other aspects of its morphology (e.g. cephalic papillae patterning) and gross appearance. The black “belt” that girdles the midbody is a distinctive feature of M. balteata, and one which shows up in at least a couple others in the group, but it’s otherwise difficult to envision what this fish would look like in life. 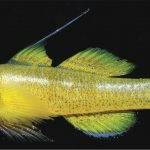 The dorsal fin is relatively short for the group—many of its congeners have dramatically enlarged or filamentous finnage—and it’s noticeably tipped in yellow, with black along the leading edge and numerous yellow markings in the rear. There are traces of yellow adorning the other fins in attractive patterns, and the face bears several thin golden lines (probably blue in life), which are comparable to those seen elsewhere in the genus. In total, this is likely a fine-looking species, but, alas, we have only this single photograph to judge it by. 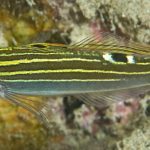 It likely occurs across a broad portion of the Eastern Coral Triangle, but it’s preference for deep, silted habitats makes this an especially obscure fishy. Here’s hoping that someday we’ll get a proper look at it. Greenfield, D.W. & Randall, J.E. (2018) Myersina balteata, a new shrimp-associated goby (Teleostei: Gobiidae) from Guadalcanal, Solomon Islands. Journal of the Ocean Science Foundation, 30, 90–99. Corals Work Together to Eat Jellyfish – Who Knew?